*Disclosure: Some of the links below are affiliate links, meaning that at no additional cost to you, I will earn a commission if you click through and make a purchase. 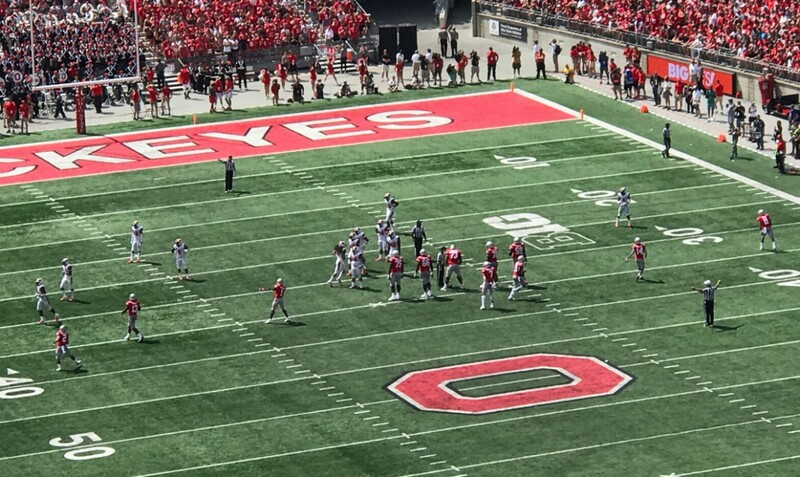 This weekend, hubby and I got the unexpected opportunity to see our home college team, The Ohio State Buckeyes, play Oregon State in the season opener. 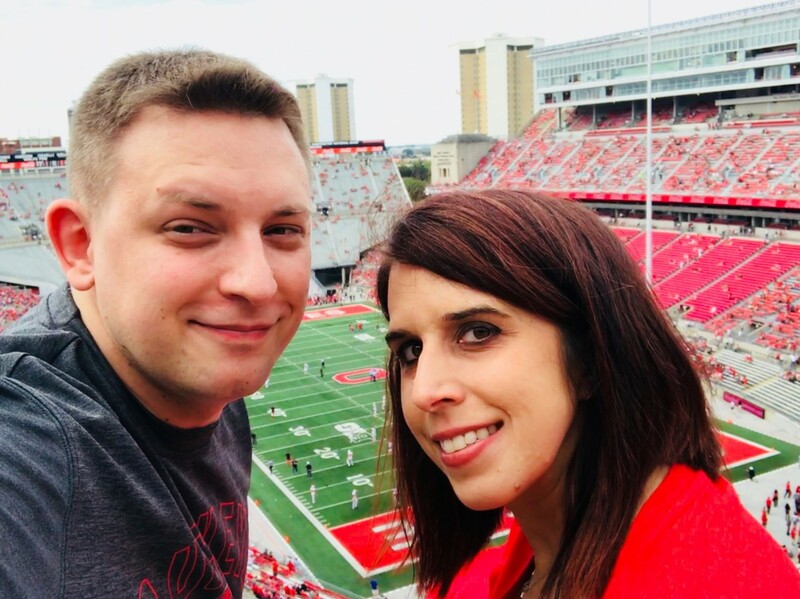 Since neither one of us have ever been to a game, we took advantage of the opportunity to experience our first football game live. Not knowing quite what to expect in a stadium that holds just about 100,000 people, we went with an open mind ready to have fun. Below are five things we learned from going. The game started at noon, so hubby and I decided to leave home before 9:30 in the morning to get there by 10, which is when the gates opened. That was the plan, anyway. We thought we’d drive right on up, park, and be good to go. That is not quite what happened. Traffic was backed up two miles before the exit, and GPS kept trying to take us off to some back roads. Instead of following my gut, I listened to GPS. Apparently, a lot of other people did too. To top that off, the roads GPS wanted us to take were either blocked off due to the game or closed completely from construction. ( Ohio loves their construction.) We finally found our way around by just following the line of cars in front of us. Hey, it was game day on Campus. We just assumed they were looking for the same thing we were! Luckily, we were right. The garage where we ended up was fairly close to the stadium, which made it a really easy and short-ish walk. By the time we were seated, there were just about 75 minutes until the game started. But we were no longer sitting in traffic. It’s the little things. Like, really early. While we were waiting in lines to find parking, people were running in front of cars, drinking and stumbling around. On game day, there is no ‘acceptable’ time of day to start drinking, Any time of day (or morning) goes. Apparently, fans start tailgating and drinking before 7 AM. Some likely stay up all night. And some of those probably miss the game entirely because they’ve already passed out drunk. I’m not dissing anyone’s experience, but if you do decide to partake in starting the party early, do so responsibly. Be respectful and mindful of those around you. The last thing you want is to get kicked out of the game or off campus. Cops are everywhere, making sure it remains a safe environment for all. Not alcohol related, but a very important side note. Be sure to stay hydrated. I know drinks are expensive and outrageously overpriced at the stadium, and they don’t allow you to bring your own in. If it is a hot day, be sure to buy a bottle of water. Some stadiums allow you to bring a clear and empty bottle in to fill once you are inside. One girl in the section next to ours passed out from the heat because she wasn’t staying hydrated. Pay the crazy $4 for a water and stay safe. It’s better than passing out. 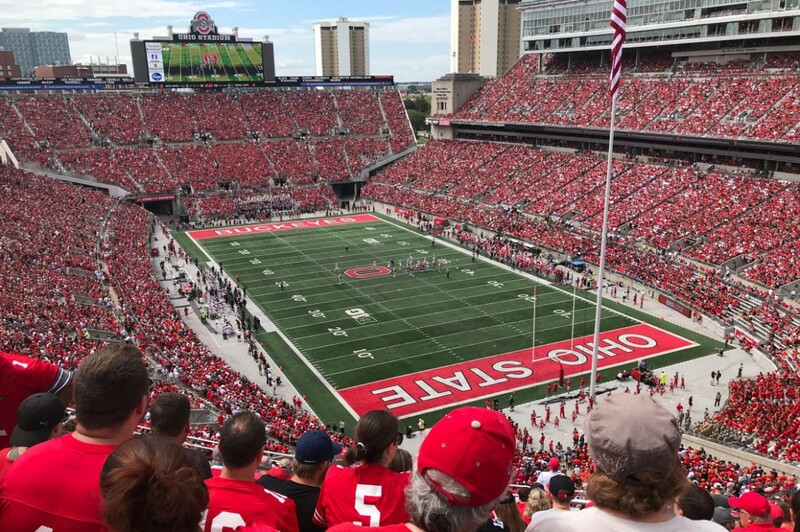 Going to the game, I wrongly assumed that once the game started, everyone’s eyes would be glued to the field. I thought that everyone would be soaking in every second of the game. If someone around them talked, the talker would get death glares. This was not the case. People do talk, carry on conversations, and are in and out of the stadium the entire time. We had a group of guys behind us talking the entire time about bar hopping and out-lifting people at the gym. A lot of fans go just for the experience of just being in the atmosphere. I mean, it is a totally different feel from watching on TV, and there is so much going on. The energy in the stadium is insane. Whether you go to watch, socialize, or a mixture of both, it really is an environment for nearly everyone. Also, watch the band. The band puts on one heck of a performance. I am impressed by how much work, choreography, and coordination goes into some of the performances and routines. I, for one, would knock down an entire line of people with my lack of coordination. The amount of hours that must go into nailing their routines has to be insane. Hubby and I failed on this one. During the game, the weather was expected to be sunny and 85 degrees. Because we checked the weather the night before, we didn’t think it was supposed to start raining until later in the afternoon, well after the game ended. We obviously didn’t prepare very well because we failed to apply sunscreen. To be honest, the thought didn’t even cross our minds until we were already there. There was some overcast, but for the most part, it was hot with a lot of direct sunlight. Mix that with sitting on metal bleachers that reflect the sun…and you have a sunburn! Be sure to watch the weather right before leaving home to see what may happen by halftime or the end of the game. Clouds started rolling in just as the second quarter ended, and by the end of halftime, it was downpouring. We weren’t prepared for that, either. But hey, the cool rain felt good on our crispy red legs and arms! I’m one of those females that knows what a touchdown is, and that is about it. Oh!, and a field goal. Beyond that, I knew who was offense and who was defense on the field, but nothing else that was happening. Whenever a flag was thrown, I didn’t know who had the penalty or why. There were a few times that I almost cheered, but it wasn’t for anything good that the home team had done. In fact, I would have been cheering for something Oregon State had done. That may have gotten a few empty (or full) beer cans thrown at me! There were plenty around. haha. Eventually, I decided to just sit quietly until those around me cheered, then I knew I was safe. If I do go to another game, I will definitely study up on some of the rules so I at least have some understanding as to what I am watching. All in all, it was a fun experience and I am glad that I finally got to see our home team play at the stadium itself. Would I go to another game? Definitely! With a little preparedness (*cough* sunblock *cough*), I’ll be ready. To show your team pride and be game day ready, be sure to get a shirt and wear your team proudly! Previous postBullying in Schools: When Will Enough Be Enough? Not Everyone Watches the Game! yes indeed correct. My first rugby 7 were only spent mostly trying out different foods from the wide array of stalls near the stadium. we didn’t watch the entire game as most of the guys from the bench are drinking anyway LOL. Haha…trying out different foods and socializing is more my speed! With not understanding the rules, my attention tends to wander. Rugby sounds like it would be fun to watch, too! Thanks for reading! Great tips! This cool weather does feel like football season! Last week definitely didn’t feel like football weather! I’m sure that is coming soon, though! Thanks for stopping by! Cool tips. I second all of them. Thanks for sharing. These are such fun and useful tips, especially number three! I’ll definitely keep them in mind in future! Glad you found them useful! Thanks for visiting! I haven’t been in such a long time. I would love to get to a football game this season! I hope you do get to a game this season! Enjoy it if you do! Thanks for visiting! The tips and advices here are very helpful in getting some seats on a football match!. Thanks for sharing! I’m glad it can help! Thanks for stopping by! We don’t have this type of football matches in my city but I have been to live cricket matches where we experienced all the same things. Some people appeared to be there to socialize and consume their alcoholic beverages more than they were interested in the match. One one of the days the weather stopped play so that was definitely an unexpected damper. The weather delayed the game here too by an hour after halftime because of weather. It does put a damper on things. I bet a cricket match would be fun to watch. Thanks for reading! Perfect tips to ensure we have a good time before and during the game! 🙂 You’re right about planning in advance, especially when it comes to beating traffic. Good thing you guys were seated well before the game began. Cheers!! Yes, planning is important to be prepared for anything that may happen. Planning or no planning, it is still a great time! Thanks for reading! These are really important tips while going to any match. Most important, be ready for any weather. Thanks for sharing..!! The weather thing is a must, I would say. I wish I would have known that one myself! haha. Thanks for reading! Such an interesting read, sounds like going to a concert! I’ll definitely keep it in mind if I ever go to a game! Yes, these could definitely apply to a concert too! Thanks for stopping by! Mostly, when going for a football match and if it between two nation’s I am always there. That’s when the crowd gets double the fun. I bet that would be very fun to watch! I’m sure the energy would be wild! Thanks for reading. Your tips and advice can be implemented on a big concert thing I think it’s wonderful. I was surprised to know that some people won’t even be watching after all those struggles to go in. Thanks for sharing your awesome thoughts and ideas. I definitely see how these could apply to a large concert as well! Especially some of the big 3-day music festivals. Thanks for stopping by! I’m glad you got to your seats BEFORE the game started! I have watched football for a long time, but find I still catch things occasionally that seem odd or different, and have to ask my husband to explain. There is so much I don’t understand. I need a class on the rules of football! haha. It is amazing how many people don’t get in until after the game starts. Thanks for reading!